While Ironman Wales is well under way in Tenby the second Ironman race of the weekend will start in Madison, Wisconsin. Ironman Wisconsin is the third qualifier for the 2014 Ironman World Championship offering another 50 slots for that race. As with most North American Ironman races it attracts a large field covering a broad range of abilities from beginner to those hunting early Kona qualification. So while the spread of results will be wide competition for those slots could also be tough. 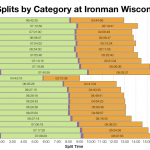 Ironman Wisconsin displays what could be labelled the standard US split distributions. 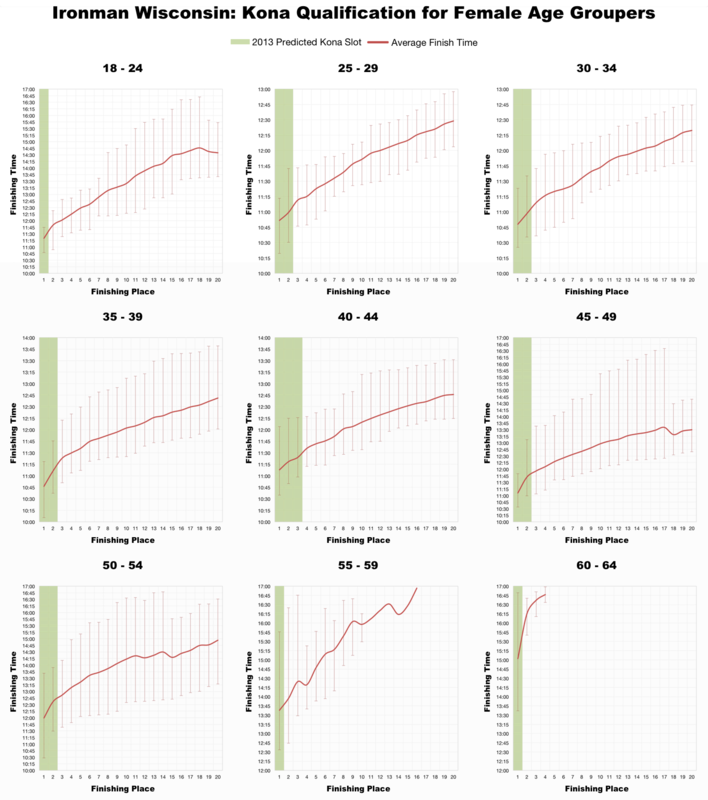 Compare the distributions from 10 years of racing in Wisconsin (top) against 1 year of racing across the whole of North America (bottom) and there is little to distinguish the two. We see the broad spread of results I mentioned with the overall split weighted towards slower times. Viewed at this high level the course, conditions and field in Wisconsin are comparable with those at other US events. 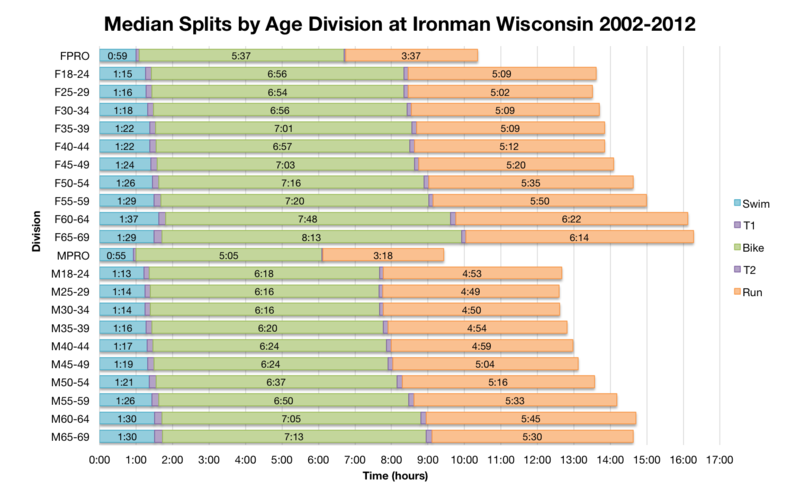 Median splits mostly concur with this analysis – average split times in Wisconsin fall close to the wider American averages. 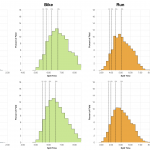 The bike is the only area where we might detect a trend towards slower than average times at Wisconsin. Otherwise on an age group level Wisconsin again neatly matches results typical of other events. Based on the bib list provided on the Ironman Wisconsin website, I’ve attempted to estimate this weekend’s Kona slot allocation in the table above. 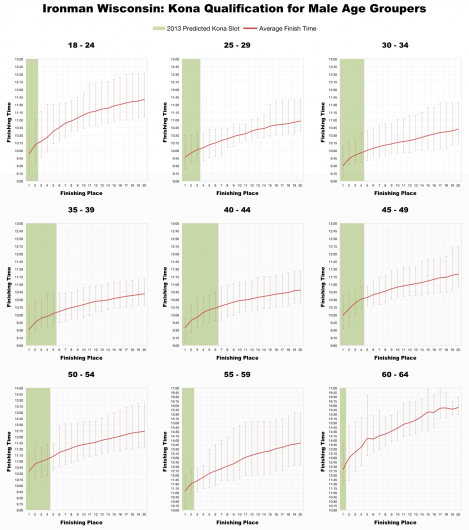 As always exact numbers will vary and depend on the actual number of starters in each age group. And as always it’s the 40-44 year old men who dominate the table and claim the most slot. 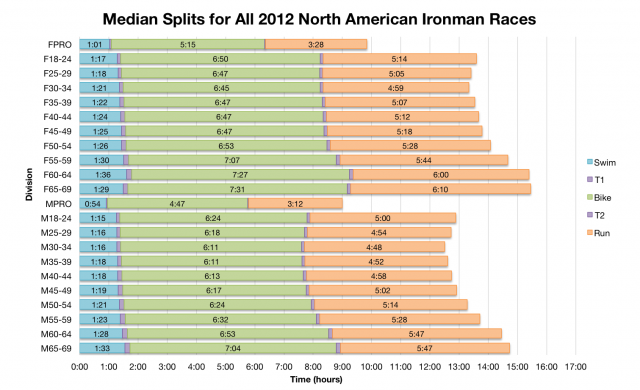 What is most striking about these charts for the average finishing times of the top twenty is how uniform they are. 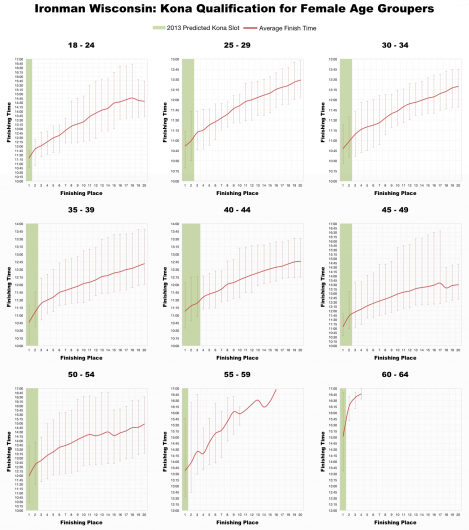 Times slowly decline with age group, but the trends from first to twentieth are remarkably consistent across divisions. The fall off in finish time is relatively rapid with over 30 minutes separating winner and last qualifier in many of the male age groups. That said it takes a clear sub-10 to be certain of qualification in those divisions. 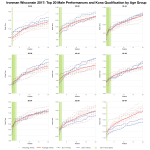 The larger female field in US races means there are more slots available, but qualification still requires a podium spot. 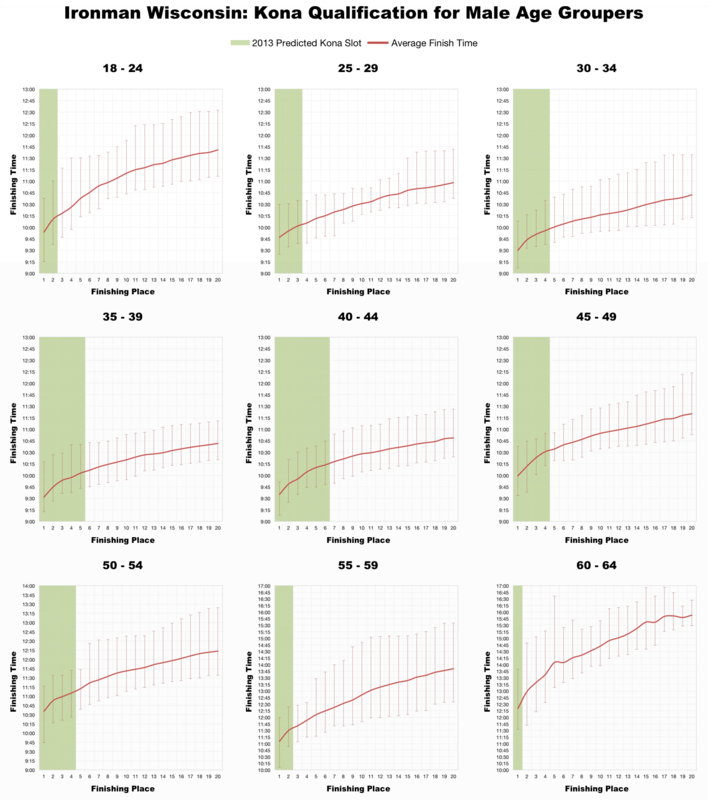 No historical qualification data has been published for Wisconsin so it’s impossible to comment on the likelihood of roll down, but being an early qualifier I’d expect odds to be low. None of my athletes are racing in Wisconsin this weekend so I’ll admit the race almost slipped under my radar, but I’ll be more vigilant next week and will have an analysis of the results up before Wednesday.